Every boxspan designed floor arrives on site pre-cut, pre-labelled to match the supplied working drawings. Boxspan design two different types of floor & deck frames, traditional joist over bearer and monoplane design with joist and bearer in the same plane. With every monoplane boxspan design your bearers are supplied with pre stamped and pre punched joist locations saving labour time. Spantec offer inhouse engineering certification for footings and bracing, along with a full set of working drawings. Each floor is individually designed to suit the requirements of the customer. 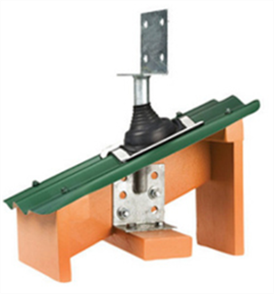 In your floor kit you not only receive your cut to size boxspan bearers and joist, but also receive all the brackets and fixings to form the full kit system. 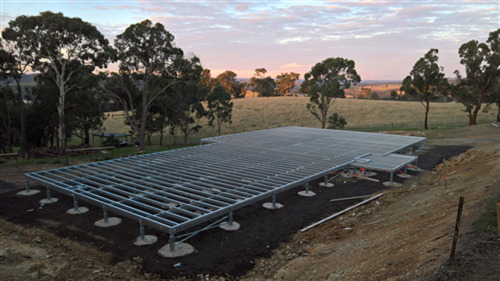 No need for brick piers, each designed Boxspan floor system have the unique steel adjustable EZI Pier, level during or after construction. Handling Boxspan rafters is easier as they are lighter than timber rafters. As blocking is not required, even for long spans it leaves a tidy finish for exposed rafters. Long-spanning Boxspan reduces the need for structural beams giving you a straight ceiling with fewer bulkheads. 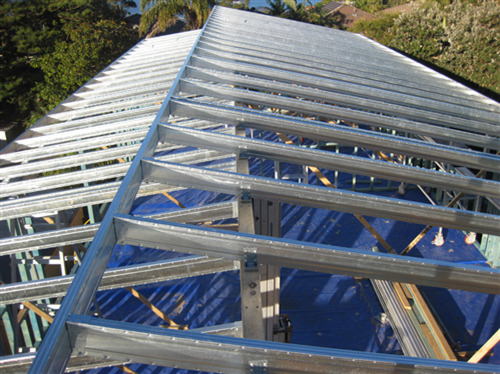 Boxspan roof frames are supplied as a complete, designed system to strict deflection criteria. Boxspan can reach a similar span for less depth than timber. 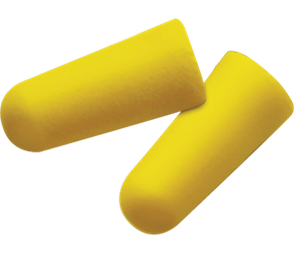 Sloping sites can remain largely undisturbed – eliminates cutting, filling and compaction. Termite proof – used in conjunction with steel wall and roof framing, expensive termite prevention can be eliminated (check with your local authority). 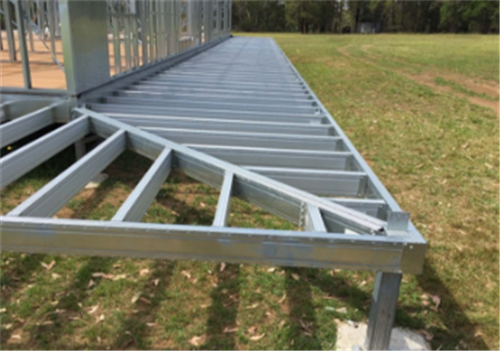 Boxspan deck frames are non-combustible and can be used in bush fire prone areas. Choice of flooring material on joists (deck boards, composite decking, FC compressed sheeting, concrete etc.). Easy connections to both steel and timber posts. 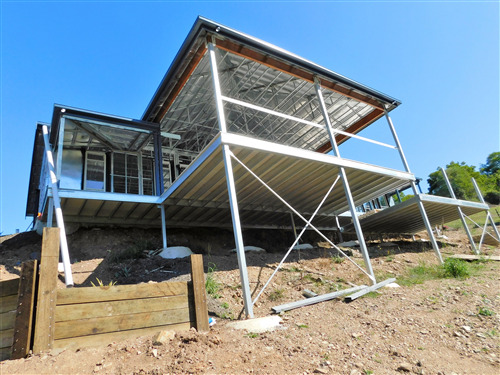 Boxspan deck frames are supplied as a complete designed kit system. 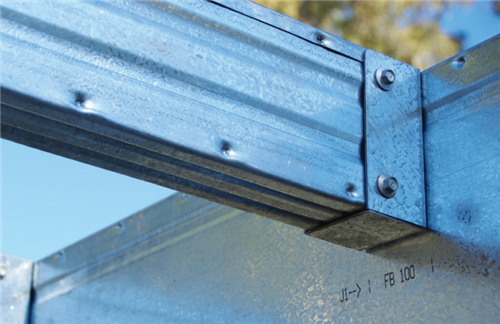 With a selection of beams sizes you can allow for access under or span over obstacles such rain water tanks. 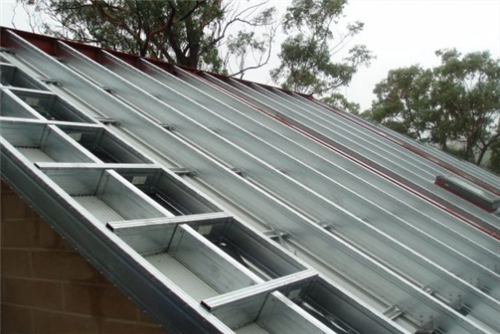 Deck flooring system works easily with posts punching trough up to the roof or up to handrail.